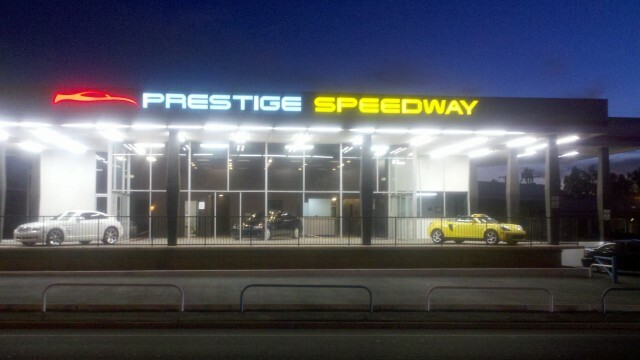 This month will mark the final Milonga T at Prestige Speedway. David left me a message two nights ago, and I spoke with him before the dance at Casa V yesterday. He said that he was closing the dealership at the end of the month, and I would like to start out by thanking him for his generosity in letting us use his space for the past year. It has been a real treat to work with David and the showroom at Prestige has been a truly magical place to dance. That said, let’s not make this a sad event. My father always told me not to go gentle into that good night! For the last hurrah we’ll pull out all the stops. Bring a folding chair, if you have it, and some food or a beverage to share. I started on a new playlist this afternoon containing the best Tandas that have always gotten people up on their feet. Lacie’s fudge will (as always) be divine. All that we need now to have the best time ever is you! I’m setting up the RSVPs now, so if it looks like a huge turnout we may spring for some extra dance floor and set it up outside as well. We will also have visiting master Michael Walker teaching the class before the Milonga, so there is even more cause to celebrate. If you haven’t already seen the notices, Michael will be teaching workshops all that weekend and his classes are not to be missed! When I first started out (back when Dinosaurs ruled the Earth) Michael was a candle in the darkness. He can be demanding, especially technically, when it is appropriate; but he always gives out praise when it is earned. It is difficult to find a teacher who can walk this line, and he has been doing it decades. If you can, take all the classes that Michael is offering! I am incredibly proud to have him come to this amazing venue for the last dance at Prestige.